This is another dish I learned from my sifu (master) Aunty Wang. These meatballs are not the ordinary meatballs– they are huge, and they are super tender. When I had it for the first time I fell in love with it, and was determined to learn it from Aunty Wang. 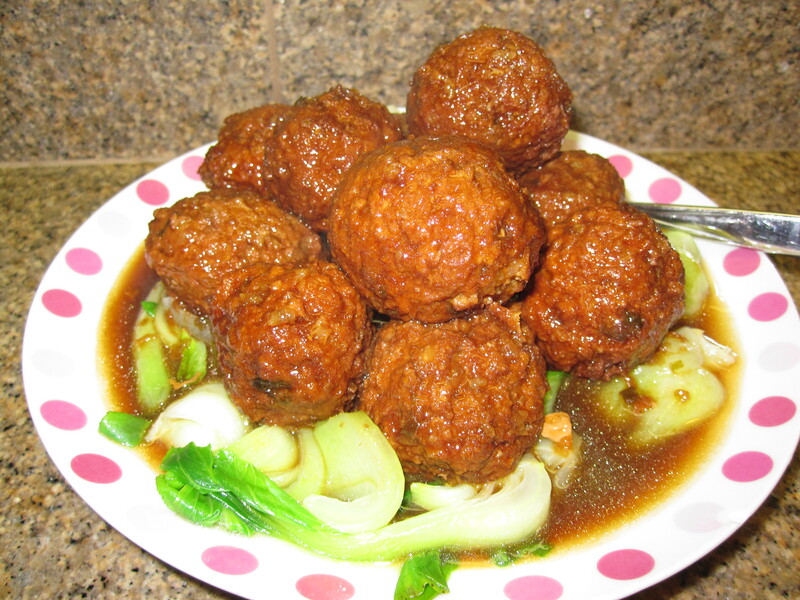 The meatballs are deep fried to brown the outside (the meat inside is still raw), then continue cooking in a soy sauce broth for 2 hours until tender. It is not difficult to make these delicious meatballs, especially if you have a stand mixer to mix the ground pork. The meatballs can be fried ahead of time and kept frozen. According to Aunty Wang, this is a typical Chinese New Year food in Taiwan, and it sure was on my CNY dinner this year. Combine 2 types of ground pork, egg and seasoning in a stand mixer bowl. With the paddle attached, mix on medium speed until the meat gets “sticky”, about 5 minutes. Add in rice, ginger, green onion and water chestnut, and mix until all combine. Pour enough oil (the oil must cover the meatballs when frying) in a deep frying pan or a pot and turn heat to high. With a table (metal) spoon, scoop up a portion of ground pork and roughly shape into a ball in the palm of the other hand. Then use the spoon to scoop up the meatball and slap it onto the palm several times (it’s ok if the meatball is out of shape). Dip the spoon into cornstarch water (stir before dipping) then use the spoon to reshape the meatball. Repeat the dipping and reshaping 2-3 times. Finally use the spoon to gently drop the meatball into the oil. Fry until golden brown outside and drain. Repeat step 2-3 until all ground pork are finished. Turn down the heat a little to prevent burning. Do not eat the meatball as the meat inside is still raw. At this point, the partially cooked meatballs can be frozen once completely cool down. In a pot, fit 12 meatballs into one layer. Add enough water to cover the meatballs. Add broth seasoning and turn heat to high, let it boil for 2-3 minutes. Cover with lid and turn heat down to low (mark #3). Let it simmer for 2 hours until the meatballs are tender and there’s some liquid left (as long as the liquid is at a boiling bubble stage, you can turn down the heat a little if the liquid dry too fast). Arrange meatballs on top of green vegetables and pour the liquid over it. Serve immediately with steam rice.